Family home on 320-acre ranch in Blue Mountains; enjoy our peace and quiet. The home is centered on a 320-acre cattle ranch in the foothills of the Elkhorn Ridge of the Blue Mountains. The house is at 4,200 ft elevation and the ridge rises to 9,000 ft. Two small streams flow through the property where you can fish or wade or 'swim' in a deep spot. Hiking, riding, snowmobiling, mountain biking, sledding, hunting and cross country skiing are as close as the front door while Baker and Union counties offer countless more opportunities. Anthony Lakes ski area is famous for powder snow and is only is 19 miles away. Water skiing and sail boarding are nearby. toilet, shower, jetted tub, Master bath - main floor. toilet, Half bath on main floor. Working cattle ranch with pastures and forest right outside the door. Each window opens onto a different view; spend time watching and you'll see wildlife and nature at its best. House phone is setup for local dialing. Gas fireplace with stone hearth and mantel from original barn beam. Sitting areas are located upstairs and down. The downstairs area has a TV, and DVD player. We have a book shelf downstairs with an eclectic selection for adults and some kids books to pickup and read or swap with a book you've finished. Puzzles, cards and a few games are in the front closet and phone table. Some games and puzzles are in the front closet upstairs. Kids toys are downstairs in the family room area. The house is two level and built into the side of a hill. A nice stay again. I have been there twice before. One negative, No one knew about the discount vouchers we used the last 2 times we stayed there. I communicated with Sherlyn and she said they are probably on the counter but she was no longer in charge. Then I talked to the ski area and they said the property management Chandler Ranch did not sign up as an Anthony Lakes lodging partner. Disappointing. Everything else was very nice. Wonderful home in a beautiful location. A fun winter getaway. Close to Anthony Lakes for skiing (downhill and cross country), sledding and snowshoeing. But also great snowshoeing right around the ranch. Fit 9 of us very comfortably. Everything was just perfect and met our needs for the best ever reunion place to be. The scenery is beautiful, we woke to about 60 elk in the field, just an arrow shot from the house. Plenty of room inside and outside of the house for our 10 family members. We set up badminton, horseshoes, targets for BB guns, flew balsa wood airplanes; we played lots of table games, shot rubber band guns, made paper airplanes, and we took a day trip to Anthony Lakes, a beautiful alpine lake - great place for a picnic, hike and taking int he views. A marvelous time was had by all, ages 3 to 69. The City of Haines, population 420, is 8-miles away, with Baker City, population 9,800, 20-miles away providing the comforts of small town needs. Baker Valley, an agricultural center of industry, was a thriving gold mining center in its history with numerous ghost towns to explore. The Oregon Trail passed through the valley below the Ranch where the Oregon Trail Interpretive Center is about 25-miles away. 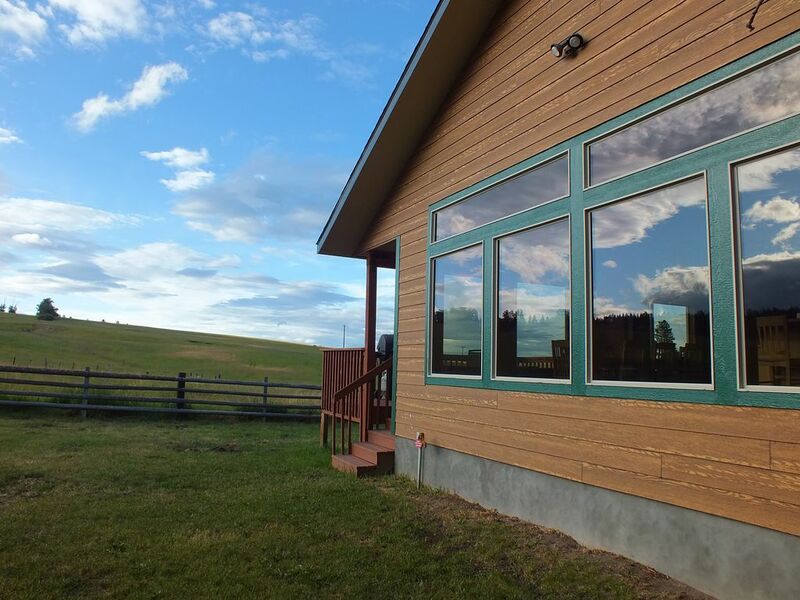 Deer, elk, coyote, turkey, bear and other wild animals live on the Ranch and can be seen from the comforts of the house or outside on the decks. The Ranch includes both forest and open fields. During the summer cattle graze just outside of the yard. This home was designed and built for vacations, and was completed in January 2003. We have tried to include everything to make your stay comfortable. The nearest neighbor is 1/2 mile away so privacy and quiet is assured. Notice: Beginning July 1, 2018 HomeAway is collecting and paying the 1.8% of the nightly fee for the Oregon State Lodging Tax. The Baker County 7% Lodging/Room Tax is an additional amount due that HomeAway is not collecting at this time. It will be due separately and calculated based upon each reservation. We apologize for the inconvenience this causes and have requested a fix from HomeAway. We appreciate everyone working with us on this as we wait for the solution. $1500/week plus room tax 8% Two day minimum stay.